Miriam Beard (born as Mary Ritter Beard in Indianapolis, Marion County, Indiana, died in Hartsdale, Westchester County, New York) was a famous Historian from USA, who lived between August 5, 1876 and August 14, 1958. She became 82 years old. Miriam Beard was an American historian and archivist, who played an important role in the women's suffrage movement and was a lifelong advocate of social justice through educational and activist roles in both the labor and woman's rights movements. She wrote several books on women's role in history including On Understanding Women (1931), (Ed.) America Through Women's Eyes (1933) and Woman As Force In History: A Study in Traditions and Realities (1946). 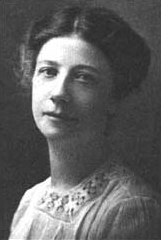 In addition, she collaborated with her husband, eminent historian Charles Austin Beard on several distinguished works, most notably The Rise of American Civilization (1927). She is born under the zodiac leo, who is known for Ruling, Warmth, Generosity, Faithful, Initiative. Our collection contains 6 quotes who is written / told by Miriam, under the main topic Travel. "The results of philanthropy are always beyond calculation"
"Wherever we go, across the Pacific or Atlantic, we meet, not similarity so much as 'the bizarre'. Things astonish us, when we travel, that surprise nobody else"
"It's only very recently that women have succeeded in entering those professions which, as Muses, they typified for the Greeks"
"One must learn, if one is to see the beauty in Japan, to like an extraordinarily restrained and delicate loveliness"